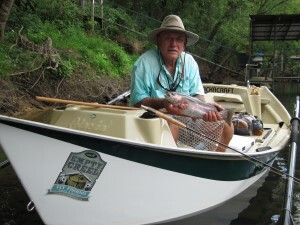 The Little Red River has been low and clear so Bo and his old friend, Paul Broddick, decided to send the weekend in the “Drifter Jane” floating sections of the lower river. 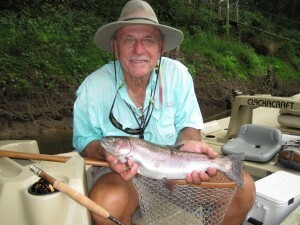 As you can see, a drift boat is great way to sneak up on some stud Rainbows! 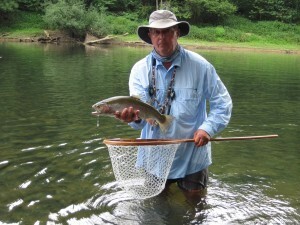 The guys caught a bunch of Rainbows and the fly of the trip was a #14 PBS, (Paul Broddick Special). In a drift boat you move so quietly you can get close to a lot of wildlife. We saw two of the most beautiful fawns still spotted up, a bald eagle, a coyote and a number of mink. If you would like to take a drift boat trip and try out a PBS fly for some stud Rainbows just book a trip with us a Empty Creel Fly Fishing Guides and Outfitter.